The ‘Save Kosci’ walkers make it to the summit of Mt Kosciuszko. 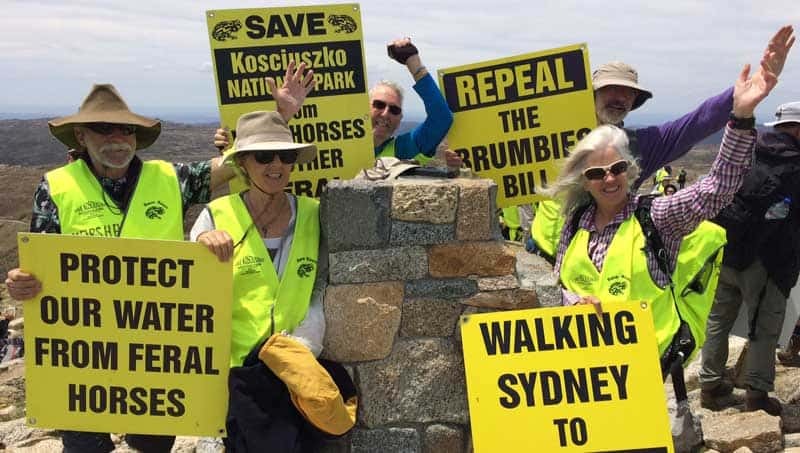 After 36 days, 790,000 steps and 560 kilometres, five walkers protesting legislation that protects feral horses in Kosciuszko National Park were joined on the summit of Mt Kosciuszko by around 200 enthusiastic supporters. Organisers hired a helicopter to carry journalists from Channel 7 and the Canberra Times circled the summit several times while the walkers celebrated at the summit. The helicopter then took the media on a tour of undamaged and severely-damaged sites in the national park. To reduce pressure on the alpine vegetation near the summit, the walkers visited the actual summit area in groups and then returned to the paved area at Rawsons Pass, for lunch and a speech. Andrew Cox, CEO of the Invasive Species Council, presented certificates to the five full-distance walkers – Marg Sharp, Alan Laird, Tom Vaughan, Paul Millgate and Donna Powell – and to the walk organiser Linda Groom. The two weeks of the walk through the electorate of NSW Deputy Premier John Barilaro indicated that the majority of Monaro voters support Save Kosci’s aims. Although there were a few negative comments on social media and from passers-by, the vast majority of reactions were very positive. They ranged from thumbs-up from passing cars to home-made cakes. The numbers at the protest in Queanbeyan on November 22 outside Mr Barilaro’s office – nearly 150 of us and just 17 brumby advocates – were further evidence that Save Kosci represents a majority view. Media coverage of the walk has been extensive, especially in regional media. The Save Kosci walkers were able to meet many influential people during the walk, including Penny Sharpe (Deputy Leader of the NSW Labor Party), Mike Kelly (member for the federal seat of Eden-Monaro), Anoulack Chanthivong (member for the state seat of Macquarie Fields), Greg Warren (member for the state seat of Campbelltown), Sally Quinnell (Labor candidate for the state seat of Camden), Ursula Stephens (Labor candidate for the state seat of Goulburn), Bryce Wilson and Peter Marshall (Labor and Greens candidates for the state seat of Monaro), John Castellari (Councillor Snowy-Monaro Regional Council), Pru Goward, member for the state seat of Goulburn, Tim de Mestre (National Party Member and former Chair of Chairs of the Local Land Services Board) and Tara Cheyne (MLA, ACT). The walkers were welcomed to country by Indigenous elders Wally Bell (Ngunnawal) and Aunty Deanna (Ngarigo); Uncle Max Harrison (Yuin) attended the start of the walk and we also had supportive contact with the Wingecarribee Aboriginal Community & Cultural Centre. By the time they reached the summit nearly 1000 people had signed the petition to the state parliament of NSW – a good start towards the aim of 10,000 signatures by end of March 2019. The walkers have forged new friendships, and once the blisters heal, will have many happy memories. Many ‘quiet bushwalkers’ have discovered environmental activism. Save Kosci will be wound up as an incorporated association in the next couple of months. Reclaim Kosci will continue the campaign. Work will continue on the Save Kosci petition and registered supporters will be contacted to ask for help in gathering signatures.